Founded in Hiroshima City in 1916, Sunfoods Inc. marked its centennial anniversary in 2016. As a manufacturer of liquid seasonings for okonomiyaki (Japanese savory pancake), a specialty dish of Hiroshima, and for other popular Japanese dishes, the company has grown gradually as Hiroshima’s food culture has evolved. 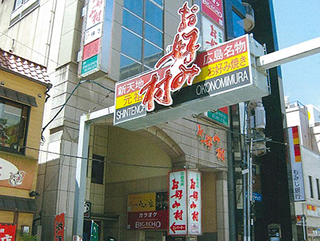 Its flagship products are Mitsuwa Okonomi Sauce and Higashimaru Okonomi Sauce, which are sauces especially for okonomiyaki. Sunfoods’ okonomiyaki sauces are now used by all 25 okonomiyaki restaurants at Okonomimura, Japan’s famous food theme park specializing in okonomiyaki. The company takes pride in the fact that its okonomiyaki sauce was certified by Hiroshima City as one of the first Hiroshima Brand products in the category of “delicious food” along with its refrigerated/frozen okonomiyaki product, OKONOMIMURA. 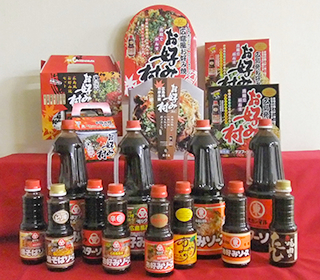 The company began to develop overseas markets in around 2000, and currently exports Mitsuwa Okonomi Sauce and other liquid seasoning products to 21 countries and regions, including the U.S., U.K., Canada, Germany, China, Taiwan, Hong Kong, Malaysia and Singapore, striving to increase worldwide visibility for Hiroshima’s food culture. 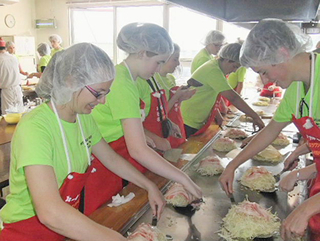 The company also offers a professional okonomiyaki-making course for prospective okonomiyaki restaurant operators and hands-on okonomiyaki-making classes for tourists and other people wishing to experience how to make okonomiyaki. These hands-on okonomiyaki-making classes annually attract about 3,000 people, including 500 from outside Japan. 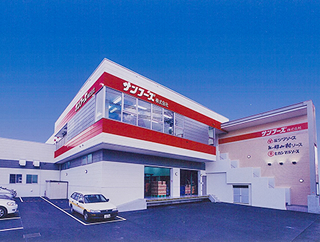 The company will continue to develop safe and delicious food products unique to Hiroshima that can satisfy both business and general consumers, ensuring that quality and hygiene standards are maintained. Your continued support for the company’s business activities would be highly appreciated. 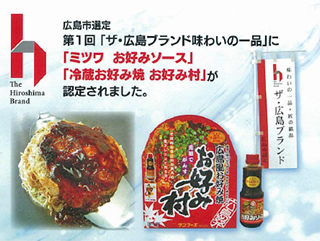 Develop, produce and distribute refrigerated/frozen okonomiyaki products (e.g. OKONOMIMURA) and liquid seasonings (e.g. Mitsuwa Okonomi Sauce, Japanese barbecue sauce and Japanese vinegar). Offer a professional okonomiyaki-making course for prospective Hiroshima-style okonomiyaki restaurant operators, help them design their store and provide business guidance. Offer hands-on okonomiyaki-making classes, promote Hiroshima-style okonomiyaki through okonomiyaki-making demonstration and sales, and exhibit the company’s products at various events. Heiwa-dori Branch, The Yamaguchi Bank, Ltd.
Yoshijima Branch, The Hiroshima Bank, Ltd.
Funairi Branch, The Momiji Bank, Ltd. This Okonomi Sauce is recommended by Okonomiyaki chefs and used by all 25shops located at Okonomimura, a nationally-known food theme park focusing on Okonomiyaki, HIROSHIMA's Specialty. The Sauce was certified as one of the first Hiroshima Brand products by the Hiroshima City government in2008. Try to use this sauce not only with Okonomiyaki, but also with a variety of other dishes too, like Yakisoba noodles, Takoyaki, stir-fried vegetables, pork cutlet, hamburger steak, omelet,curry and fresh vegetables. This product is a super-hot version of Mitsuwa Okonomi Sauce. It's piquant taste is very popular among those who like spicy foods, and it's attracting more and more repeat customers who feel something is missing in other products. From our customers we have received many inquiries about where they can buy this sauce. We create this mild, less salty sauce with a rich flavor by blending grated raw garlic (grown in China) with Mitsuwa Okonomi Sauce, a high quality item made in Hiroshima that has been certified “the Hiroshima Brand”. This sauce was developed by combining yuzu juice produced in Kochi Prefecture with Mitsuwa Okonomi Sauce in order to create a new mild flavor. Honey and moshio (salt made by burning seaweed) are also added for enhanced smoothness. This product is a multi-purpose sauce featuring a combination of rich flavor and refreshing taste. 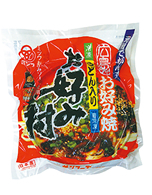 Currentry, this product has been adopted by a major convenience store chain as its sauce for ready-made Yakisoba noodles. A spicy version of Mitsuwa Yakisoba Sauce, this product was launched to commemorate the 90th anniversary of our founding. Its spicy taste combined with sophisticated sweetness makes this sauce very popular among grown-up customers who aren't satisfied with conventional sauces. This barbecue sauce is made mainly from well-aged soy sauce, with its rich aroma; 100 percent home-grown barley and miso (fermented soybean paste) made using whole grain barley and select spices. Rich but simple, this sauce has also been well received as a business-use barbecue sauce. Enjoy it at home, not only for barbecues but also for pan-fried noodles such as yaki-soba and yaki-udon. This product is a frozen Okonomiyaki with Udon noodles, Hiroshima's specialty. Make a slit in the plastic wrap. Microwave the product covered inside the wrap for aboout 4 minutes and enjoy the authentic taste of Hiroshima-style Okonomiyaki. The product contains no meat. Copyright © SUNFOODS Inc. All Rights Reserved.